RRB 2018 Application modification for Bank Account Details is now available for RRB ALP, Technician, from 22nd September 2018 to 1st October 2018. RRB has released an Important Notice of CEN 01/2018 Modification of RRB ALP Bank details for Application Fee Refund. If in case the candidate had entered some wrong information (Bank details) and want to make modification/change in the RRB 2018 Application Form so as to avoid refund of money to the wrong account. Well, don’t get panic as the RRB has a solution for this. You can now make edits or modify the application. This can be done online on the official website only. 02/01/2019 Latest update: RRB ALP Bank Modification link active. Visit the link to update details. Last Date to Update Details extended to 6th January 2019. 27/12/2018 Latest update: RRB ALP Bank Modification link active. Visit the link to update details. Last Date to Update Details extended to 31st December 2018. Update (29/09/2018) – Candidates now can mention their Additional Educational Qualification details as well in the Application along with RRB Selection, Post-Preference and Exam Trade selection. The Link can be accessed from 1st October 2018 to 6th October 2018 (23:59 Hours). Update (21/09/2018) – The RRB has activated the link to modify their RRB ALP Bank details for the refund of money. The Link is live from 22nd September 2018 (11:00 Hours) to 1st October 2018 (23:59 Hours). Candidates can log in with their credentials and modify/change their account details. In this article, we will explain how to make changes in the Bank Account details modification in RRB 2018 Application. The candidates can modify the application form only if they have submitted the RRB 2018 Application Form completely. 7 How To Select RRB Region, Selection of Exam Trade, and Confirm Bank Details? The modification of the RRB 2018 Application is allowed only for the Bank Account details. The Modification Link will be available in the Online Portal Registration of ALP and Technician (CEN01/2018) from 22nd September (11:00 Hours) to 1st October 2018 (23:59 Hours). The modification to the RRB Registration and the RRB 2018 Application Form details can be done once only. In the RRB 2018 Bank Account Modification Process, the candidate can change their Bank Account details such as Beneficiary Name, Bank IFSC Code, Bank Account details etc. The candidates are advised to make changes before the closing date so as to avoid technical issues. Note: Once the Bank details are submitted, you can not be changed later. So after knowing all the important information about the RRB 2018 Application Form Modification, its now time to know how to make the modifications online. Visit the required RRB’s Official website. Search for “Modify Account Link” on the Homepage of the Online Registration Portal of CEN01/2018 (ALP & Technician Level 2) and click on that. 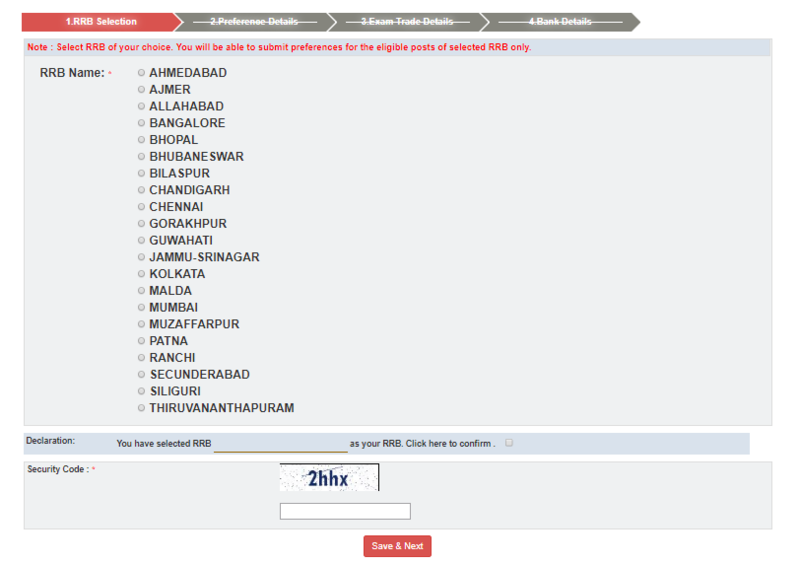 Select the Desired Regional RRB Official Website. Log in using the Registration Number and Password and Captcha Code. Enter the Bank Account details such as Beneficiary Name, IFSC Code, Bank Account Number etc. After making the changes, submit the details. Your Bank Account details will be modified successfully. Take the print out of the latest application form and save it for future reference. The Vacancies for Railway Assistant Loco Pilot and Technician has been increased from 26,502 to 64,371 vacancies. Total Number of Vacancies for Assistant Loco Pilot is 27,795 vacancies and for Technician, Posts is 36,576 Vacancies. On 1st August 2018, the Railway Recruitment Board had released a recruitment notice mentioning about the increase in the ALP and Technician vacancies to 60,000 but now, the RRB has confirmed the increase of the vacancies by releasing the official notification on 21st September 2018. The Railway Recruitment Board has also made a few changes in the selection of RRB and Filling options based on the Railway Units/Posts. As per the Official Notification of ALP and Technician, it was indicated that the option for RRB, Railway and Posts shall be taken among from the candidates securing community-wise minimum qualifying marks in the First Stage CBT. Candidates who have appeared the First Stage CBT, will now have to select the RRB and the priority of options for Railway/Production Unit. Based on their selection of their RRB and Railway Units, candidates will be selected for the 2nd Stage ALP CBT. RRB has also made the changes in the field of choosing the Exam Trade. Earlier, at the time of application candidates having more than one educational qualification (ITI/NAC/HSC/Diploma/Degree) were eligible to choose more than one exam trade. But now, the RRB has decided that the candidates who have chosen more than one exam trade will now have to choose only one Exam Trade of their choice. Candidates who are ITI/ NAC Qualified, the Exam Trade shall be their ITI/NAC Trade given in the application and it cannot be changed further. How To Select RRB Region, Selection of Exam Trade, and Confirm Bank Details? Candidates can check the steps mentioned-below for update your RRB ALP Application. Read the steps carefully & follow it. First of all, visit the respective Official RRB Region Website or click on the link available below. Click on the link that says, revision in vacancies, selection of RRB, the option on Railway/Unit Posts, selection and modification of exam trade/Modification in Bank account details etc. You will be then redirected to a new page. Now Login using the credentials – (Registration ID and Date of Birth). Add or Select “Additional Essential Qualification “ and confirm it with the “Declaration” box. Then select the “RRB Region” and click on “Save and Next” located at the bottom of the page. For the chosen RRB, the list of the posts for which the candidate is eligible is displayed in the screen. Candidates have to enter their choices in order of their preference. Candidates must note that they must enter those choices/preferences that are mentioned in the list. Click on “Save and Next” option. Now, candidates have to choose their Exam Trade option for the 2nd Stage CBT. Now candidates have to confirm and modify their bank account details which they desire to receive the refund of the application fees. For the Modification of Bank Account details, candidates will receive a Valid OTP on their registered mobile number. Enter the OTP and click on submit button. The complete changes made in the form will be displayed on the screen. Take the printout of the details for future reference. The RRB ALP Application Fees will be refunded only to those candidates who have appeared the Railway Loco Pilot exam. Candidates who belong to Non-Reserved Category will receive Rs 400/- as the refund amount whereas, the Reserved Category candidate will receive refund money of Rs 250/-. The money will be refunded online only. Kindly prepare an affidavit stating you do not belong to EBC. You will be considered under General Category. If you have been selected with cut off eligible for EBC you will be re considered under general category. If you do not satisfy the general category you will be disqualified. There are no live links to update your details. No, the modification link won’t be active anymore. RRB ALP CBT 2 Post Preferences have been filled earlier. There is no way of any modification now. Thus you are not able to see any preferences. If you are applying for any other exam and accounting issue, kindly state clearly for which exam or which website link you are encountering problems, we are happy to help. No modifications can be made now. The last date has passed. Link close ho chuka h aur abb kuch nahin kiya jaa skta. I HAVE ENTERED WRONG ACCOUNT NUMBER, IS IT POSSIBLE TO MODIFY? Hi Paul, its not possible anymore. I have filled wrong passing year of my high school exam in my technician application form.how can I rectify it? No, You cannot update it anymore. Today the link for updation of bank account details are active but if I try to login using my registration number and date of birth, it is throwing an error as the registration number/password is invalid. Please help me in this regard. Apparently only the candidates whose details were incorrect are allowed to update the details. If you have not received the money and cannot log in kindly wait for a few days your money will be credited soon. Since your Exam trade is mentioned to be Maths & Physics, Kindly prepare for that. Also the Syllabus for all the Exam trade is mentioned here. Kindly Check. I didn’t get refund amount now …. What is the procedure to get refund amount ……. The process to refund the money is still going on. If you do not receive the amount in some days, Railway Board is soon going to activate the link for modification. The link will be activated here. Kindly navigate through and update your bank details. After the modification process gets over you will receive the amount in your mentioned bank account soon. Sir today link didn’t open .what is the solution. Recruitment Board has not yet activated the Modification Link. As soon as the link gets activated we will update you soon. Kindly wait for a while. I am get the refund money .please help me. Refund Money Bhut jaldi aapke account me transfer ho jayegi. Agar aisa nahin hota hai to please, jaise hi Modification Link activate ho, apna Bank details update krr k verify krr dijiye. Qualification Details ab thikk nahi ho skta hai. I didn’t get rrb Alp refund money. What is the solution to it. Link Not Activated Yet. The link is expected to be activated soon. Yes, you will be given the refund money in the account details you provided. I had fill the form and in exam trade selection, I had selected Electrian with 10+2 and Instrument Mechanic with B.Tech. please help me to know the exam trade for CBT-2, Part-B. Exam Trade will be the of the first preference that you have filled in the examination. 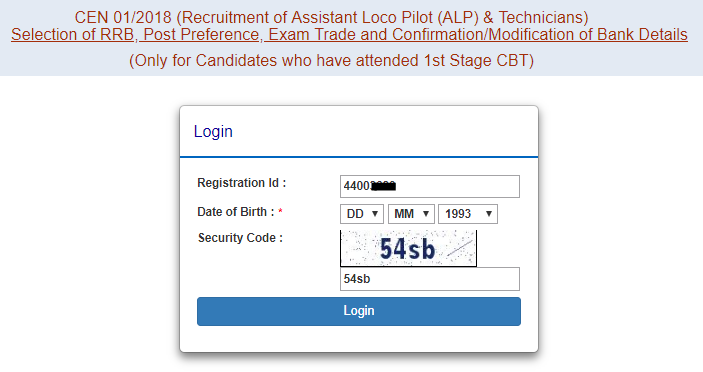 Though, if you have applied for ALP as well as Technician then also, the first preference of the candidate will be taken as the Exam trade for CBT 2. The link will be activated later, We will update the link soon. Then download the RRB ALP Application Form. Modification Link has expired now there is no more option of modification. In any case, if the link is active again we will make updates. Mera fome fill krte time 10th qualification marks% glat ho gye. Application submit hone k baad changes krna possible nahi h. Ab sirf Document Verification k tym prr hi exam marks etc check honge. Aap apna application ab correct nahi kr skte hn. Sir mera alp form fill karte samay education qualifications galat ho gaya so can you help mi to change my education qualification any chances.Please help mi sir. Remove ITI and let the application be as 10+2 with PCM only. ITI has been wrongly added. I want to add one modification in the application where in I have filled the ITI from mechanical trade which have been a wrong step. Now , no where I am getting a way to correct it out . I am simple 10 + 2 (Intermediate )with PCM from uttrakhand and wrongly the ITI has been included. Correction in application required to be simple Intermediate with PCM. Initially the application was not advancing without full filling the step of ITI and that was the reason where that is added . My request is that I have not completed ITI so include me for next examination as a 10+2 with PCM background candidate for ALP/Technician of RRB. I am Physics chemistry & Math student for Technician. But while filling the form for second CBT exam, i choosed electrical as trade by mistake. Will my form be rejected or i will be allowed to appear in the examination. Please help me to give valuable respons. i am fhysics chemistry and math student for tecnician.but while filling te form for second cbt exam i choosed electrical as trade by mistake.will my form be rejected or i will be allowed to appear in the examination.please help me. sir D Group ka be revised posts release hota hi ya ni to ALp ka only ho raha hai, 60000 post ALp ka release huwa hin na iske bareme to bathadijiye na please. I have applied for chennia & mumbai my application is rejected due to duplication. Kindly help me how to delete or change in one. Hi Rajkumar, you cannot do anything now as the Application Process is over. You can apply the next time. I applied for Group D but our status showing invalid photo so I tried so many times but it was not been success for Modified. pls. send me link to our mail ID. Railway Group-D Application ke Photo re-upload ki date over ho gayi hai. I was fill the form of RRB. But there is issue of invalid photo and i have not received any email about update. How to solve this problem? sir mra form reject ho gya photo invalid bta rha ha kya change ho skta ha sir ps help . sir mere application form me mere bhai ka photo aa gaya hai. to mujhe ab woh change karna hai to kya mai ab wo change kar sakta hu kya. new notification ke anusar 20 july tak change kar sakte hai lekin group D ki photo modification ki koi link nahi mil rahi hai. so please sir mujhe help kijiye.aur pls mujhe ho sake to group D ke photo modification ki link send kijiye. My application status is showing Incomplete as I didn’t complete the payment. Can I do it now? sir mera bhi same problem hai. lekin website par group D ke photo update ki link nahi mil rahi hai. agar apko link mil jati hai to pls send me on my email id. pls. Then how can I take my return cash, otherwise how can I add new account to my registration no now? Sir i have not given bank account no. So how can i edit application form. Sir, I’m getting that modification process is not complete. Can you please guide me. The last date to do modification in RRB Application form ended. Dear sir, is it possible to edit post preference as i filled my form on first week of march, i only applied for 2 posts only. Due to lack of information i missed the chance for upgradation. If it is possible let me know please. ab change ni kar sakte hai.. last date 31 March thi. sir, my RRB Group D application status showing Application/modification progress not yet completed. on that time final submission of application, I got a pdf form. I checked all details everything is ok, but now my application showing the application/modification progress not yet completed, please solve this problem. Contact with That RRB on call. OR SIR KAY MERA ADMID CARD AAYEGA KAY NHI PLEASE REPLY SIR. SIR. MERA APPLICATION FROM COMPLETE HO GAYA THA LEKEEN MUJHE FROM ME KUCH MODIFICATION KARI THI OR WOO COMPLETE NHI KIYA THA OR ABHI STATUS CHECK KAR RHA HU TOO KUCH NHI AA RHA HAI KAY KARU SIR. PLEASE SIR HELP???? sir i applied group d post but not printed name and date in my photo the modified date is closed if any issue in my hall ticket kindly help me sir. any other option for modify application plz reply sir plz. check your application status first. sir i applied group D post but not printed name and date in my photo the modified date is closed if any issue in my hall ticked kindly help me sir . any other option for modify application plz reply sir plz. Caste : Needs to be tagged under BC quota. I tried sending email to as suggested in rrb chennai offcial site to rrbchennai@gmail.com. No response from them. Please check. Hello sir I have written 12th roll no. Instead of 10th roll no.for apl and group D posts. So can I give the exam. Mera form galat ho gaya h kya iska sansodhan ab ho sakata h.
hlo dear sir kya 31 march k baad b form edit kiya ja skta h ?????? Can I modify ALP application after 31st March? ?plz reply me sir. Sri in my application inside the photo iwant to change the date sir.what i want to do the modify meathod sir pls tell me. Sir, 31st March 2018 ALP form final submit korechi. But Photograph e name and Date lekha hoini. Ata ki r modify kora jabe? Plz reply me sir. Sir i have filled the railway alp technician form. bymistake my gender mentioned as female instead of male now i paid the application modification fees but the website did not allow me to change it what can i do now please help? sir if form rejected then fee will be refunded or not..
Sir My photo uploaded in my RRB Group d Application form 01.09.2017.So My Form Accepted or Rejected? 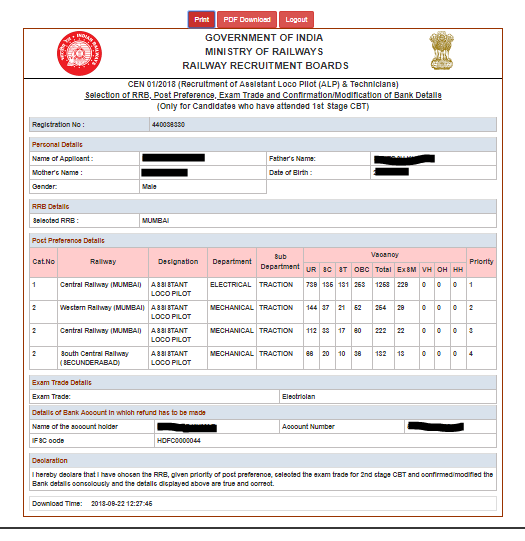 SIR, in RRB Chennai group D post there was network prblem i have wrongly entered gender now i cant modify that male as Female what to do for that…. sir mere photo ke niche date nahi hai . to mere ko form modify karana chaia kay..
sir mera diploma apearing me h aur galti se form me diploma qualified dal gaya h….kya me diploma hata sakta hu? i have applied for rrb mumbai instead of rrb bangalore is there any chance to register for rrb bangalore please reply?? can i modify my RRB application even the last date is over? Sir Mera modify nhi ho RHA invalid registration no. And dob bta RHA Kya kru. yes. otherwise your application form may be rejected. can my alp application modify after 31 march 2018? Abhi to last date 31st March h last date application submission ki. Can my alp application modify after 31 march last date ? zone change kara jayagi ka?? accepted but may b you will face problem at the time of verification. Sir qualifications details wrong fill ki hai wo change krni hai plz help 12th pass out year 2012 change krke 2010 krni hai. Plz help mi sir. read the article we describe there how to edit your application. in my photo, i’m wearing black shirt and my name on it is in black color. is there any problem? Sir i have entered a wrong date of birth so can i make any changes in this. If possible please tell me a solution. yes, you can it through doing modification in your application. for more read this article properly. the link is working. you have to try again. sir ihave entered date of birth wrong how to correct it? you can change it through modification. sir mere ALP ke form ka abhi tak confirmation massage nahi aaya, 25 days ho gaye kya mera form reject ho jayega? I have not completed application form but fee is successfully paid.and now site is not opening.in this case my fee is refunded or not.?? Sir kya mera form koi cancel kar sakta hai Jo mera registration no. Or DoB Janta h ya koi form m correction kr sakta hai kya??? Sir , I stayed in Delhi but I filled the communication address as the permanent address . I got the problem of center of the exam , I want to give exam in Delhi but venue is not mention in the form . so I got confused on this. your application may be rejected until you will not complete the process and submit it. I have paid rs 250 earlier for EBC, modification charges rs 100, modify EBC to UR rs 500,, how much amount will be refunded???? photo pe name and jis date me photo li ti vo date likhni hai. sir mere 10th or Iti 2014 me ki he….or form me dono year 2014 he to kya rrb form accept karega…. Sir,after paid modification fees successfully,when try to login it shows your registration/modification not yet completed..what should i do?? check the link and try again. yes, you can modify it. sir ab modification nai ho skta kya. sir meri Iti or 10th ek hi saal me ki he….Mene Iti 8th base se ki thi …to kya mera form reject ho jayega…. haanji, aap change kr sakte ho. Meri account no ka ek digit miss kardiya fillup karte waqt ab kya karu plz bataiye sir. you have to edit your application through paying the modification fee. do it fast. tomorrow is d last date for modification. Sir, by mistake I didn’t enter the date of result in the field provided in the application form of Group d.But mentioned the year of passing in the specified field.Is it mandatory to fill that column.sir pls reply me if it need modification..
MY APPLICATION WILL BE STRUCT AT AFTER PAYMENT BUT MY PHOTO WILL BE NOT APPLOAD . THEN WHAT I DO? plz monther name change correction karan hai!!!!! Hi sir,OTP not receive in my mail id & Mobile num due to registration time is my network speed is not good.so the page was automaticaly go on home page.now what can i do.pls help me.Because no more time to apply that post. so is it possible to rectify this? Sir plz tell me is this big mistake? I put in photo wrong date of apply. I put own my date of birth. It’s must be change. Sir please inform me. Sir I have filled form of group C instead of ALP/technician. So can I modified it?? The number I provided in the application has lost, how can I change it in my application form? don’t worry. you will check your call letter through e-mail id. no, you can’t change RRB’s region after registration. Can I change my photo in application for ALP technician? sir loco pilot ka from modified kyu ni ho rha avi. Sir my higher eduation is B.E.but by mistake i entered post graduate as my higher education in the last of application form. Should it be modified or leave same.plz reply. Sir…thodi si help chahhiyeh thi..
par maine rrb zone jammu ka fill kiya hai..
#sandhya tm use modify kr skkti ho tme uske lye 100 pay krna hoga railway ko. sir form modify karne ke bad kitni fees written aa jayegi . I have made a mistake in my rrb group d application form. Instead of giving photo capturing date I have given my date of birth in uploading photo option with my name in the application form. Is it create any problem for my exam purpose. I have given my date of birth in place of photo capturing date in uploaded picture option of my application form. what should I do?Is it create any problem for my exam purpose? sir mene payment done kar diya hai. Par view status me kuch show nahi kar. I have screenshot of the payment gateway. What to do now. you can modify your RRB application form only 2 times. i have applied for RPF(SI) group A and have modified my year of 10th passing. i have paid registration fees and completed all the required things. im unable to print my application now. Log-in with the click on “Already Registered” link. Sir , me sc candidate hu and free pass me galti se No ho gya kya yeh yes ho payega ?? you can edit your application form through modification. yes, you can change your mobile number. for more read the article. Sir mein OBC hun.mujhe economically backward class karna nahi tha. But galat se ho gaya hai. Can I change? Even I did the same thing….have u got the solution? form me launguage change krni padegi apko. Sir kya number upload Karna chahiye ebc form se? Muze dho numbers dikh raha hai ebc income certificate mein.I am totally confused. Please bathao kis number enter Karna hai? Sir can I change my residential address? I came from OBC catogery nd by mistakes also select EBC so i paid 250₹ fees. So tell if I modified my application thn also again paid 500₹ fees.? Or that 250₹ whose I paid by my mistakes tht will be refunded?? Sir I mistakly wrote my father’s name.. Can I avail to change through modification process. I mistakly wrote my father name. Sir Maine group D ka form RRb Chandigarh se bhara hai aur mujhko change karke RRb Delhi karna hai. Wo kaise change hoga ? Sir mra Jo classification of address sbse niche tha usme glti ho gya usme Mai ratu dal di jbki others dlti isme admit card ane m koi problem hogi Kya ??? Sir, I have already used 2 chances of modification. But forgot to write name on photograph. What can I do? Hey Biswajit same my problem. So can you help me. change your photograph through modification of Application. Aap registration k bad RRB Zone change ni kar sakte ho. sir i want to change my post preference and haven’t made payment, can i change it or not pls guide as soon as possible. change your photographs through “Modification in Application” link. Sir, i have selected my gender as female by mistake instead of male. So, the application fee to be paid is being displayed as 250 ,so i did not pay the money. How do i change this now? I tried to register again but it was not possible. sir on my registration roll no. by mistakenly i have put SL no. of HSLC examination certificate..
will my form be rejected. I am belong to category of OBC, but wrongly save the form in ECONOMICALLY BACKWARD CLASS in RRB ALP AND TECHNICIAN POST, I have not paid the fee of rs-250/-,if there is a chance to change my application and payment details. Please sir advice me to how can I change the category and fee option. or can i apply to a new appication.. please suggest me sir. I also face same problem. Sir i have mistakenly filled the degree column in the 2nd stage of application form.Can i delete the degree details? Since i am a final year student so that i will become eligible for technician post. Sir modification fee to 100 hai..
Sir can i change my ALP post with technician post ??? Sir, mai OBC se form fill up krr diya hu, abb mujhe General se daalna hai, kya modification ho skta hai kya??? I HAVE FILLED 10 TH PASS ONLY.. I HAVE B.E.MECHANICAL DEGREE. HOW TO CHANGE IT ? Can i change my uploded photo? yes, you can change through modification. Sir maine ALP post galti se aplly kar diya hai kya main technician me change kar sakta hun??? Sir how can l change my photograph?There was an error in the time of modification.What can i do? which is the proper website of the RRB banglure to apply . how to cancel my application.it’s refund available? I am belong to category of OBC, but wrongly save the form in ECONOMICALLY BACKWARD CLASS in RRB ALP AND TECHNICIAN POST, I have paid the fee of rs-250/-,if there is a chance to change my application and payment details. Please sir advice me to how can I change the category and fee option. or can i apply to a new appication.. please suggest me sir. sir please rply me.. suggest me what should i do? you can change rrb zone after registration. Sir I have forget to mention the name and date on the photo which I have uploaded. you have to modify your application form by paying modification fee rs. 250/- then you can edit it. I have submitted my form with necessary fees,then I came to know the photo I uploaded doesn’t have date and signature.so, what should I do..? ?plzzz sir kindly I need your help..
you can’t change rrb zones. you may try to apply from another zona of RRB. sir meri jo photo upload hui hai usme name and date nhi dali……..
Rs.500.Is there any problem for me. Sir,mera caste certificate 26.05.2005 ka issue tha,kya iyehi chalega? Dusara Abhika nikalana porega? Please inform me sir And lastly a more question, I have already done one modification,can I more? Sir,mera caste certificate 26.05.2005 ka issue tha,kya iyehi chalega? Dusara Abhi nikalana porega? Please inform me sir. Sir by mistake i opt wrong cast i have to change my cast.how can i change it . modification fee is not refundable. I am belong to OBC category but by mistake I did pay 250 for exam fee, Can I change the same. And last 3 day my payment are still show pending for verification. you can Contact with RRBs through the contact number which we have provided in the article. To do modification in the application. i had entered wrong date of birth and not done payment should i modify my application form or do a new registration from another email id? I want to change educational qualification.How it can change.My degree is not complete but i fill in form so i want to change it. you can change name through modification of Application. Is rrb zones are changeable? CAn i change refund bank details.. plz comment..
Sir, maine apna form ek cafe se fill up kiya pr cafe Wale ne bahut se application form me apna bank account dal rha hai jisse rrb ka refund amound uske account me aa jaye Aur es tarike se wo candidate ko pagal bana raha hai. Usne mere form me bhi apna account no. fill kar diya hai so pls refund money after proper analysis. kuchh log candidate ko pagal bana ke paisa kamane ka dhandha kr rahe hai. Mera registration no. 1180604988 or dob 07-07-1994 hai. Is there any specific background color need in the photo during form fill up? If so what are those colors? Sir,I am ebc category and wrongly click obc,can I change this in application form. Hello sir ,maine rrb guwahati me form dal diya hai aur ab use change karke gorakhpur karna chahata hu.kya aisa ho sakta hai. no, you can’t change the Regions after registration. you can try to fill application again from another region. am I able to change state? I want to change rrb zone how it possible. Sir i m 3B candidate…..by mistake i have to select obc in application filling…then i realize category in central exams are UR. So i have to change category in application modification,is it possible are any chances to change my category…plz sugest any solution and i m already pay full pament & also pay modification fee…. yes, you can change through modification in application form. you can not change RRB Zone, once registration completed. You may try to do new registration from another zone. Apka form cancel ho sakta h. app form me change kr skate ho. account se cut gye h now what can i do……? don’t worry.. the amount will be refunded if transaction not completed, you can contact with rrb’s phone number or bank customer care number. I have applied Class D post in RRB Chennai on 10/2/2018. Due to Cafe negligence I can not fill the fee refund format. What can I do for Fee refund to my A/c. you can modify your application form through modification. Sir I have entered the wrong RRB Zone there is any way to change the zone…? you can’t change the RRB’s zone after submitting for registration. Sir,I have no problem in application of RRB form but the IFSC code was given wrong by me .So,How Can I correct it?If i’ll not correct it then I can’t get the refundable money. I farvently request you to give me a way otherwise I will not be refunded the application money.Thank you. i have done same mistake..have you got any solution? sir i ma completed degree.10th,inter & degree.my age 28(general),i am eligible this recruitment? in case eligible which post. haan ji, aap application form me photo change kr skate ho abhi bi. same problem happen here so what can i do for change the date?? I have applied for RRB Secunderabad in Group D. I want to modify it for RRB Bhubaneswar in Gp D. Can I do modification? I HAVE UPLODE PHOTO..AND SUBMITE.BUT WRITTEN ABOVE THE PICTURE DATE OF BIRTHHAS GONE WRONG…WHAT CAN I DO THIS? I am belong to category of OBC, but wrongly save the form in ECONOMICALLY BACKWARD CLASS, till I have not paid the fee, where the payment option shown Rs250/-. Please sir advice me to how can I change the category and fee option. sir i have make payment by debit card but railway site does not have take my account number and application is submitted. how can i get refundable amount ? Sir i have to change my location how can i change it..
you can’t change RRB Zone after registration. Sir i am fill in the form exam fee i paid Rs.500/-, but modification in fee & date i access amt refund yes or No. Sir I paid RS 250 but further process from preference I don’t filled…now o m entering my registration no.it generate alert that you form is not completed what I do? Then go n compelet all the section. Priya same problem I paid 100 but further process ? sir i fill the registration but not received registration id and password for ALP. Not get registration id and password do the forgot id. Same problem with me please let me know if u find the solution.